1. The chuck taper or chuck handle and spindle taper must be cleaned with anti-rust oil. 2. Rotate the chuck and return the three jaws to the place under horizontal level of the chuck nose. 3. When inserting arbor or chuck handle taper in the chuck taper, use beetle to hammer soft iron bar to hit the chuck in. But be careful not to hammer three-jaw or front shelter; otherwise, it may cause poor product accuracy or crack and damage to the outer body. 4. When inserting the tool you want to use into the chuck, be sure to insert it into the bottom of the three jaws or more than 2/3 of the depth and really lock the tool to the hook wrench so that the chuck can clamp tools tightly. 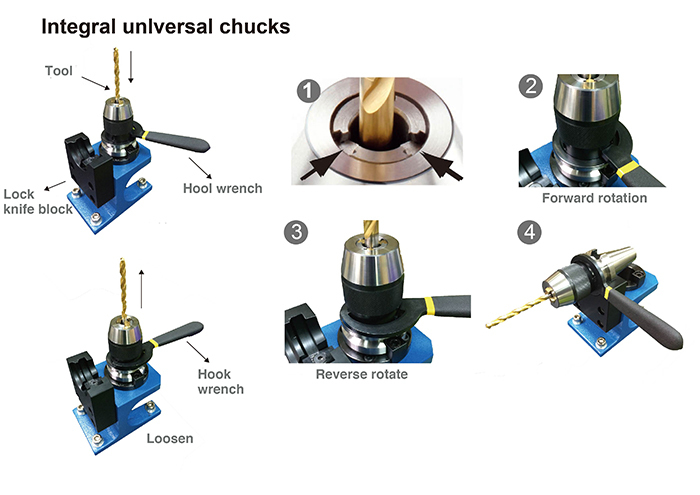 After correctly installing the chuck and tool, please check and confirm whether the automatic drill chuck really clamps the used tool before starting operation. When selecting tools, please select the appropriate tool for automatic drill chuck to avoid overload and damage to the tools. When starting to use chuck for processing, the chuck can only forward Instead of reversing. Otherwise, the chuck will lose its function. When the chuck is running or does not stop, be sure not to touch the chuck to prevent from being dragged or rolled by the machine and cause accidents or injuries. When the chuck is cracked, damaged, or significantly deformed, do not use the chuck anymore. Besides, remember not to repair, reorganize or even remodel it to avoid accidents or injuries.